Jenkins often seeks new roads and always goes the distance, particularly where philanthropy is concerned. A colleague’s recommendation that he look into the North Carolina Community Foundation took him down the unplanned path of establishing a donor advised fund with NCCF, at the time a somewhat new and unknown entity. His relationship with NCCF began when he called then Executive Director Elizabeth Fentress and asked some basic questions about the community foundation concept. Although he operated a private foundation, there was always a nagging concern about costs and whether trustees would carry out his wishes after he was gone. A call to Fentress led to a lunch in Raleigh, where he made the decision to begin a donor advised fund – and a friendship that continues to this day. When Jenkins’ home county of Bertie, along with neighboring Hertford, seemed ready for an affiliate community foundation, he was instrumental in helping to get the local foundation off the ground. “Wayland was someone who certainly could get things moving with a few phone calls,” Fentress said. “And that’s true to this day.” The Bertie-Hertford affiliate began in 1999 in part through his founding gift and call to action among local leaders. He no longer serves on the board of advisors, but continues his work for the affiliate as director emeritus. Recent conversations with some on the advisory board of the Bertie-Hertford Community Foundation revealed that he was the reason they serve. “Well, my involvement started with a phone call from Wayland Jenkins,” is the way many began their recollection of service on the affiliate board. Those associated with the monumental restoration of historic Hope Mansion would no doubt tell similar stories of how they initially got involved. Jenkins was the first president of the Historic Hope Foundation board and again was instrumental in raising early sums to qualify for matching state and federal grants to purchase the historic home near Windsor and begin the restoration process. The plantation home is important as the residence of North Carolina Governor David Stone (1770-1818) and for the glimpse it provides into rural life in our state in the late 18th and early 19th centuries. Jenkins’ family also has established a memorial fund to benefit Hope Plantation in honor of his late Uncle Charles H. Jenkins. This fund also is held by the Bertie-Hertford Community Foundation and annually awards significant contributions to continue restoration work at Hope. Jenkins recently decided to donate a substantial portion of his art and furniture collection to Chowan University, which created and named a fine arts center in his honor. His appreciation for art began as a student at Wake Forest College (now University) and was fostered through worldwide travels that began while he was in the U.S. Army. His donations to the new Wayland L. Jenkins Jr. Fine Arts Center include original art and early 19th century furniture, providing students and visitors insight into these important works and also appreciation for the “art of collecting,” according to the program created for the September opening. We were fortunate to share a recent conversation with him in the little house off Ahoskie’s main street that serves as Jenkins Investments, a partnership that he and his brother Joseph Henry launched to manage farm and forest interests, rental properties and other assets. When asked about his philosophy of philanthropy, Jenkins confided that it began early and somewhat reluctantly for him. Despite a lifetime of observing parents who were community leaders and generous with their donations of time and treasure, he was a typical 20-something when the local hospital board asked him to contribute $100 to a fundraising campaign. “I was shocked to death!” he said. Automobile dealership roots must run deep, as Jenkins is obviously not afraid to “close the sale” and ask for contributions. “I always want to remind people that we have to give first before we go out and ask others for money to establish funds,” he said. “After all, who wouldn’t want their assets going to an organization where their funds will be set up forever, and their names will go on and on,” he wondered. 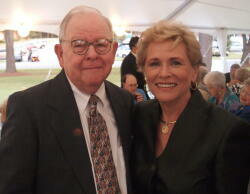 NCCF CEO Jennifer Tolle Whiteside called Jenkins “a model philanthropist” and affiliate leader. “He definitely lives the credo and knows the best, most effective requests for involvement with the Foundation -- or any organization -- come from those who are passionate about what they do,” she said. The slogan at his father’s automobile dealership all those years ago somehow fits to this day: “Never forget a customer and never let him forget you.” Wayland L. Jenkins Jr. is certainly unforgettable, as is the legacy he leaves his home.